1. To prepare the cucumber, heat the vinegar with the sugar in a small pan over a low heat for about 3–4 minutes, until the sugar has dissolved. Add the peppercorns and pour over the sliced cucumber. Set aside for 30 minutes at room temperature, to pickle. 2. For the burgers, heat the oil in a small frying pan over a medium heat. Add the onion and cook for 5 minutes until softened and golden. Add the crushed garlic and caraway seeds and continue to cook for 1 minute. Remove from the heat and leave to cool. 30 minutes or for up to 4 hours to set slightly. 4. In a small bowl, mix the soured cream with the horseradish and the remaining chopped dill. Season to taste. 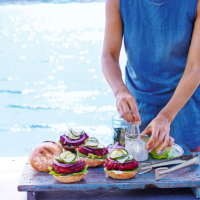 buns with the soured cream and lettuce, topped with some red onion slices and the soused cucumbers.